Provide synergetic support derived from students, faculty and alumni, while utilizing various programs and organizations, to create a vibrant and fun active learning environment to enable our physics students to tackle challenges that advance science and technology with the aim to significantly impact society throughout their careers. Peer mentoring is about students exchanging knowledge (wisdom) to create a supportive learning community. Often the forest is lost for the trees, and a little help from a friend can keep one on track without getting too far lost when so many new things are being learned at the same time. Sometimes one loses their bearings until being reminded of their immediate and long-term goals as they answer basic questions from others that are just developing their goals as they struggle with coursework, etc. Peer mentoring is a win-win relationship. Junior and senior level physics majors volunteer to guide freshman and sophomore level physics majors through the physics curriculum. Peer mentors typically provide advice to help mentees navigate through the physics curriculum successfully and instill confidence for our students to seek out challenging opportunities. Graduate students in the MS Applied Physics program frequently serve as mentors to our juniors and seniors, and graduate students can seek mentoring from alumni. Step 2: Fill out only the first page if you are requesting a mentor and both pages to mentor. Step 3: Send the completed form to the PUMP Leader in charge of mentoring (listed above). Step 4: Attend as many mentee and/or mentor group meetings as possible. PALS is an acronym for Physics Active Learning Sessions that aims at improving student understanding of calculus based introductory physics concepts and guiding students toward developing good habits for problem solving that enables critical thinking. These sessions are free and nonobligatory to students enrolled in courses supported by PALS, such as PHYS 2101. Each session is led by an undergraduate physics major that has demonstrated mastery of the material and trained on how to facilitate an active and engaging learning experience. To learn about PALS hours, click here. PALS was proposed by undergraduate physics majors participating in PUMP during spring 2017. This is a student driven program and was immediately welcomed by the department chair and the instructors of the calculus based introductory physics classes. Department support for PALS allows undergraduates to be paid as coaches to run sessions that are given in addition to other excellent programs on campus that aim to help students learn physics. However, PALS is special in that it is completely student driven. As such, it is our physics undergraduates that literally pump up PALS. Our session leaders are passionate about a very important aspect of peer mentoring ¾ striving to help students develop a firm understanding of physics and to gain appreciation of how physicists approach problem solving. How to become a session leader for PALS tutoring? Step 2: Send the completed form to the PUMP Leader in charge of PALS Tutoring. Step 3: This is a highly competitive paid position. If selected, attend all training sessions. Undergraduates and graduate students are encouraged to participate in outreach activities. Examples of some activities include: Help conduct star parties for the general public; work demonstration booths for Science Expose; work events at Science Olympiad competitions conducted across North Carolina; help describe the physics curriculum and the environment of the physics department to perspective physics majors at the Explore Open House at UNC Charlotte and to incoming students at SOAR; help with judging science fairs at elementary and middle schools, and become role models for high school students looking toward a well paid, fun and rewarding career in physics or applied physics. PUMP provides synergetic support derived from students, faculty and alumni working with existing programs and organizations on campus or in the community to facilitate outreach. All outreach activities are on-going from institutional programs that stem from government, commercial and non-profit organizations, such as student clubs already on campus. A very good example is SPS (Society of Physics Students). SPS is its own independent student club. The Physics Undergraduate Mentoring Program encourages students to take leadership roles, volunteer in outreach events, and become active members in clubs such as SPS. Notice that PUMP is not responsible for putting these events on. Rather the PUMP Leader for outreach helps connect physics majors with an interest to volunteer in outreach activities to the people looking for volunteers to make their events successful. We seek to find win-win opportunities for our physics majors to be involved in community outreach. How to get networked into the loop for finding outreach opportunities? Step 2: Send the completed form to the PUMP Leader in charge of Outreach Activities. Step 3: Plan on donating some of your free time, and by all means have fun helping out! Undergraduates and graduate students are encouraged to form supportive study groups. One such type of study group is a cohort of students interested in studying and preparing for the Physics Subject GRE. This has been formalized through PUMP. More frequently, informal study groups form among friends taking the same class. These are not managed in any way because this takes place organically as a student driven process. Faculty and other students not taking the classes cannot offer specific help. However, PUMP encourages students to form study groups, and best practices of how to make these study groups most effective is discussed through peer mentoring, and from mentoring by faculty on key issues. How to participate in the Physics GRE preparation study group? Step 2: By Email, let the PUMP Leader in charge of community learning know you wish to join the GRE prep study group. Step 3: Plan on donating some of your free time to extra studying and practice test taking! Students meet faculty from the department and other departments to hear personal stories about how faculty back in the day navigated their career path including current challenges they face, what research interest they have and why. In an informal setting, students have the opportunity to ask questions and seek advice, thereby obtaining a diverse set of perspectives. Other guests include campus experts to explain best practices in preparing for the workforce, how to find internships, win scholarships and the best ways to secure a teaching or research assistantship. Students will be speakers as well, presenting their own research, and to give advice on overcoming challenges that range from every day classroom responsibilities in learning physics, time management, doing research, or adding career building opportunities. The mentoring program is a required component for (AP)2. The original impetus to create PUMP was to provide close mentoring for our undergraduates that join the applied physics accelerated program, referred to as (AP)2. 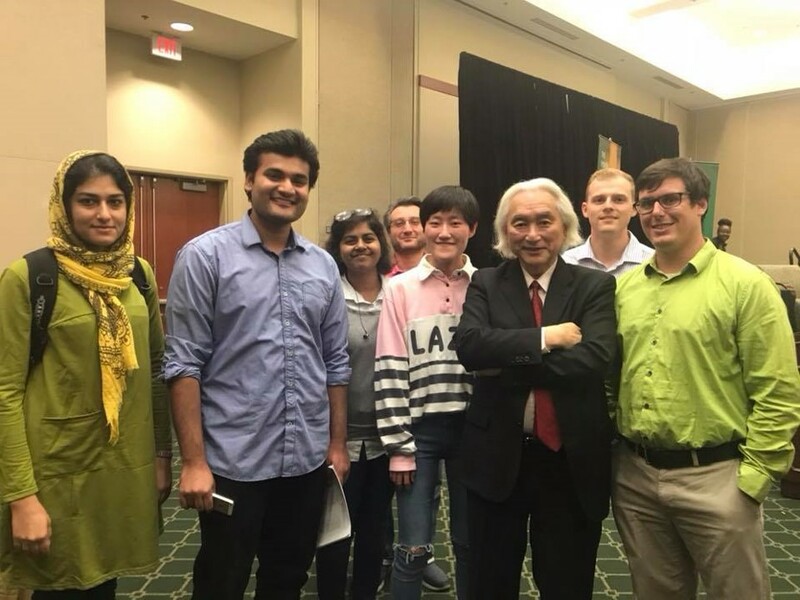 These undergraduates are the type of students that choose to come to UNC Charlotte from high school specifically to study physics with a passion for applied physics. Given that the (AP)2 program is highly competitive, the (AP)2 freshman class are expected to be advanced in college AP credits, and over their 5 years of training will have ample time to take on leadership roles, become active in research within our department research laboratories working with faculty, aggressively seek research opportunities outside of our University and/or obtain paid intern positions at companies, and become well prepared to likely be our next entrepreneur mover/shakers in industrial physics or be successful as they go on to obtain their PhD. We expect our (AP)2 graduates to be best prepared to make significant impact in the advancement of science and technology. Hence, the mentoring program has been designed to serve this purpose. PUMP is available to all physics undergraduates and MS Applied Physics students! Mentorship is a very powerful source of inspiration that can help students overcome their personal weaknesses, and help students capitalize on their strengths. As such, there is no reason to limit mentoring to (AP)2 students only. While statistics don’t lie, and most people that graduate (from any college/university) will not be the next Einstein, or physics Nobel prize winner, every graduate has the opportunity to be tremendously successful in a career involving physics or applied physics. We aim to help students make this happen and live up to their full potential regardless of their backgrounds. For example, students often pick up a strong interest in physics after they have been taking courses in other subjects, and only later decide to change their major to physics after being in college for a while. Regardless of the different starting points, PUMP provides a supportive environment to help any student make the transition she/he must do to be competitive in the job market. Physics is a tough subject, and so is the job-market relating to the physics discipline (it's a global market). But we got your back with a wind toward success. What is PUMP and how does it help students succeed? You can find a copy of PUMP's meeting schedule here.